Address of Landlord for Notices: ___________________. Address of Tenant for Notices: ____________________________. Renewal Terms: _____ (__) Renewal Terms each for _____ (___5) years. Calculated pursuant to Article 17. The Basic Rent is subject to adjustment pursuant to the provisions of Section 2.1 and 2.1.1 of this Lease. The term "Basic Rent" as used in this Lease includes the portion of the rent for the Expansion Land. Maximum Rate of Interest: Prime plus two percent (2%) per annum. For purposes of this Lease, the term "Prime" shall mean the rate announced from time to time by _________ Bank, as its prime or reference rate. If _________ Bank shall cease to use its prime or reference rate, then Landlord shall select the rate of another financial institution to be substituted therefor, which shall be a major money center commercial bank. Late Charge: 2% of the overdue amount. Rental Deposit: $___________ applicable to _____ (____) and _______ (____) month's Basic Rent. Brokers: Landlord's and Tenant's Broker: ___________________. 1.1 Premises. Landlord, for and in consideration of the rents, covenants and agreements hereinafter set forth, hereby leases to Tenant and Tenant hereby leases from Landlord, upon and subject to the terms, covenants and conditions hereinafter set forth, all that certain parcel of land situated in the County of _________, and State of _________ delineated on Exhibit "A" attached hereto and incorporated herein ("Land"), together with those certain Landlord's Improvements as defined in the Work Letter attached hereto as Exhibit "B" ("Work Letter") to be constructed by Landlord, including an approximately _______________ thousand (_____) square foot building ("Building") and all other improvements, machinery, equipment, fixtures and other property (except Tenant's trade fixtures), to be installed or located thereon and all additions, alterations and replacements thereof (collectively "Improvements"). Herein the Land and the Improvements are referred to collectively as the "Premises". Tenant acknowledges that this Lease is subordinate and subject to (a) all liens, encumbrances, deeds of trust, reservations, covenants, conditions, restrictions and other matters affecting the Premises ("Title Matters") (i) in effect on the Effective Date of this Lease as specified in Exhibit "C" attached hereto and incorporated herein ("Preliminary Report") or (ii) approved or deemed approved pursuant to this Section 1.1, ("Permitted Encumbrances") and (b) any law, regulation, rule, order or ordinance of any governmental entity applicable to the Premises or the use or occupancy thereof, in effect on the execution of this Lease or thereafter promulgated. In the event that, after the Effective Date any new Title Matters appear of record, such matters shall be subject to the review and approval of Tenant which approval shall not be withheld so long as the new Title Matter does not materially and adversely impair the use or occupancy by Tenant of the Premises for its intended purpose. Tenant shall deliver written notice to Landlord of its approval or disapproval of such Title Matters within ten (10) days after delivery by Landlord to Tenant of such new Title Matter. If Tenant fails to respond within such ten (10) day period and Landlord delivers a written reminder notice to Tenant and Tenant fails to respond within five (5) days of the delivery of the written reminder notice, the new Title Matter shall be deemed approved. 1.2 Term of Lease. The initial term of this Lease ("Initial Term") shall commence on the Delivery Date (defined in Section 1.3 below) as such date may be extended until (i) the date of Substantial Completion of the Landlord's Improvements (as defined in the Work Letter) ("Commencement Date"); provided Tenant shall be permitted by the City to occupy and use the Premises at such time. The Initial Term shall end on the date which is _________ (___) months after the Commencement Date unless sooner terminated pursuant to the terms of this Lease. Any reference to the Term of this Lease or similar reference shall be a reference to the Initial Term together with any renewal terms of this Lease specified in Article 17. Any reference to Lease Year shall refer to each consecutive twelve (12) month period during the Term commencing on the Commencement Date. For purposes of this Lease, a "Lease Month" shall be defined as those successive calendar month periods beginning with the Commencement Date and continuing through the Initial Term or any Renewal Term of this Lease. 1.2.1 Acknowledgment of Commencement Date. Tenant shall, within ten (10) business days of request therefor by Landlord, execute an acknowledgment of the Commencement Date prepared by Landlord in the form of Exhibit "D" attached hereto and incorporated herein ("Commencement Date Acknowledgment"), provided, however, that the failure of Tenant to execute such acknowledgment shall not affect any obligation of Tenant hereunder or the Landlord's determination of the Commencement Date. If the Tenant fails to execute and deliver such Commencement Date Acknowledgment or provide written notice of Tenant's disagreement with the contents thereof, then Landlord may deliver a written reminder notice. If Tenant fails to respond in writing to the written reminder notice within five (5) days, Landlord may deliver a second written reminder notice. If Tenant fails to respond in writing to the second written reminder notice within five (5) days, then Landlord and any prospective purchaser or encumbrancer may conclusively presume and rely upon the fact that the Commencement Date is the date specified in the Commencement Date Acknowledgment. 1.2.2 Early Occupancy. Tenant shall be entitled to early occupancy of the Premises thirty (30) days prior to the Commencement Date in accordance with this Section 1.2.2 and the Work Letter. Tenant's early occupancy of the Premises for installation of furniture, fixtures and equipment shall be subject to all the terms and conditions of this Lease, other than the obligation to pay Basic Rent. Early occupancy of the Premises shall not advance the expiration date of this Lease. Landlord shall have the right to charge Tenant for any utility costs incurred as a result of Tenant's early occupancy of the Premises. If during Tenant's early occupancy of the Premises, Tenant desires to have security for the Premises, Tenant shall provide such security at no cost to Landlord. 1.3 Delivery of Premises. Landlord shall use its commercially reasonable efforts to deliver the Premises to Tenant on or before ___________ ("Delivery Date" with Landlord's Improvements) (as defined in the Work Letter) Substantially Completed. 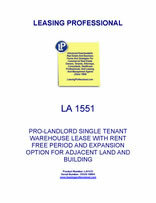 If Landlord is unable to deliver the Premises to Tenant by ___________, then Tenant shall be entitled to receive from Landlord the amount of _________ Thousand Dollars ($_____) per day for the first fifteen (15) days beyond ___________ that Landlord fails to deliver the Premises (subject to force majeure as provided in Section 19.21) and ____ Thousand Dollars ($______) per day for the fifteen (15) days beyond ___________ that Landlord fails to deliver the Premises (subject to force majeure as provided in Section 19.21) and the Delivery Date shall be deemed to have occurred on such later date. If Landlord fails to deliver the Premises on or before ___________ subject to extension for force majeure as provided in Section 19.21 of this Lease, then Tenant shall, as Tenant's sole and exclusive remedy, have the option to terminate this Lease by delivering written notice ("Termination Note") to Landlord. If Tenant accepts delivery of the Premises, then Tenant shall be deemed to have waived its right to terminate the Lease as provided for under this Section 1.3. Notwithstanding anything herein to the contrary, in the event Landlord tenders possession of the Premises to Tenant in a substantially completed condition during that period of time from __________ through and including _____________ (the "Non-Acceptance Period"), then, Tenant shall have the right not to accept possession of the Premises during such period by notifying Landlord, within five (5) days of the tender of possession of the Premises to Tenant, in which case the Commencement Date shall not occur until ___________. 1.3.1 Acknowledgment of Delivery Date. Tenant shall, within ten (10) business days of request therefor by Landlord, execute an acknowledgment of the Delivery Date prepared by Landlord in the form of Exhibit "E" attached hereto and incorporated herein ("Delivery Date Acknowledgment"), provided, however, that the failure of Tenant to execute such acknowledgment shall not affect any obligation of Tenant hereunder or the Landlord's determination of the Delivery Date. If the Tenant fails to execute and deliver such Commencement Date Acknowledgment or provide written notice of Tenant's disagreement with the contents thereof, then Landlord may deliver a reminder notice. If Tenant fails to respond to the reminder notice within five (5) days, Landlord may deliver a second reminder notice. If Tenant fails to respond to the second reminder notice within five (5) days, then Landlord and any prospective purchaser or encumbrancer may conclusively presume and rely upon the following facts: (i) the Delivery Date is the date specified in the Delivery Date Acknowledgment and (ii) that the Premises were in acceptable condition and were delivered in compliance with all of the requirements of Work Letter.